February has already been very busy! We started off at a 5th grade boys' basketball tournament, followed by driving our son to a birthday party, going out on a date with my husband out to eat (alone), then coming home to a messy house, my girls were in hot water...followed by my attempt to "catch up" on blog life. So currently... is hosting a currently February! That Farley rocks! LISTENING... to a quiet house is sure nice after a day of boys' basketball. THINKING...we had an in-service this past Friday and Monday. We are looking at the new way to be assessed, SLO's and SMART goals...yikes. A lot to take in. I have been teaching 22 years and am soooo lucky to be teaching science...I love it, but to set a goal with a percent when I only see my kiddos once a week for an hour makes me nervous. Has anyone created any for science yet? WANTING AND NEEDING... my almost 19 year old to come home next weekend for her birthday...however, my husband and I are also celebrating our 20th wedding anniversary out of town, before she arrives home. I can't wait to have all 6 of our family members around the table! What a gift for dear ole' mom! 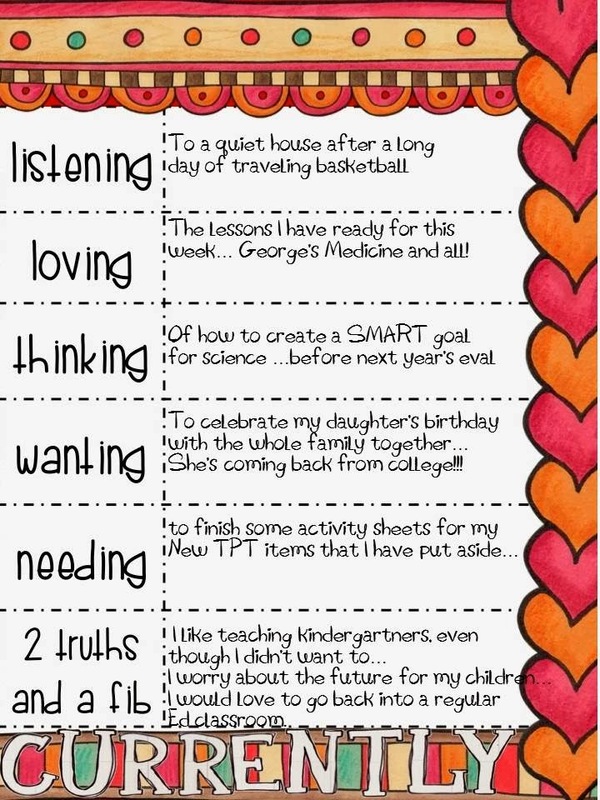 My truths, I am not certified to teach kindergarten, however I "facilitate" their lessons. I actually love those little buggers! They are sponges! I also am nervous for the future of my children and for the kiddos I teach. Education is a bit scary right now. However...my fib...I love science and with all of the testing right now, I don't really want to go back to a regular ed classroom. I love that my students can't wait for science each week and they fight for the PBIS extra science class with me! It is good to be loved by so many wonderful students k-5! I tried to peruse your blog but I am not able to see it. Luckily, you commented on my blog and that allowed me to click on your name to find you. Those dreaded SLO's are everywhere!! We started them this year in my district, but luckily I was familiar with the process via my previous district but not completely. Talk about stressful. This is our pilot year, and we also transitioned to common core and are developing a new standardized test...but they are not being tested on the new stuff we are learning, but the old-whaaa! Education is definitely a scary place these days. Sorry for going off into politic land. I think that K-5 Science only is super awesome! Kids love science and I think that it is often placed on the back burner. Which makes me sad because science is one of the most creative content areas...and it teaches up how we became "us". so to speak. If You Mustache, I Heart Teaching.